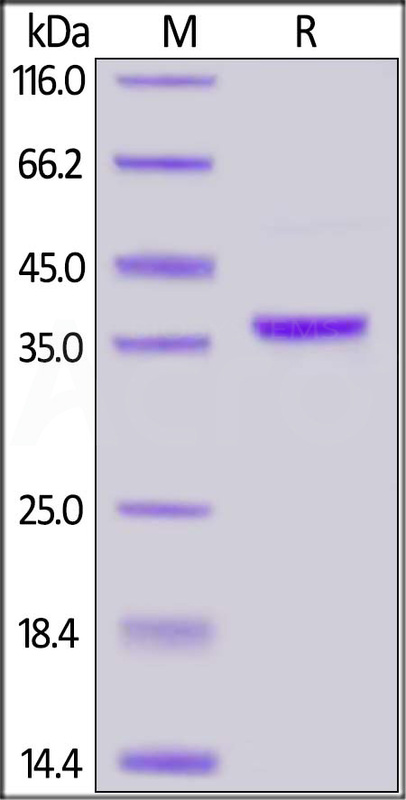 Human AIMP1, His Tag (EM2-H5142) is expressed from E.coli cells. It contains AA Ala 2 - Lys 312 (Accession # AAH14051). The protein has a calculated MW of 35.2 kDa. The protein migrates as 36 kDa under reducing (R) condition (SDS-PAGE). Human AIMP1, His Tag on SDS-PAGE under reducing (R) condition. The gel was stained overnight with Coomassie Blue. The purity of the protein is greater than 95%. Aminoacyl tRNA synthase complex-interacting multifunctional protein 1 (AIMP1) is also known as multisynthase complex auxiliary component p43 and endothelial monocyte-activating polypeptide II (EMAP-II). AIMP1 is a cytokine that may be induced by apoptosis and is also released from professional antigen-presenting cells such as dendritic cells. The release of AIMP1 renders the tumor-associated vasculature sensitive to tumor necrosis factor. Furthermore, AIMP1 binds tRNA and stimulates the catalytic activity of cytoplasmic arginyl-tRNA synthase. This protein possesses inflammatory cytokine activity. Also, AIMP1 negatively regulates TGF-beta signaling through stabilization of SMURF2 by binding to SMURF2 and inhibiting its SMAD7-mediated degradation. (1) Barnett G., et al., 2000, Cancer Res. 60:2850-2857. (2) Park S.G., et al., 1999, J. Biol. Chem. 274:16673-16676. (3) Tandle A.T., et al., 2009, Exp. Cell Res. 315:1850-1859.